This enchilada pie is remarkably similar to a lasagna … just with more hot peppers, and corn tortillas instead of pasta. The magic is in the spicy, creamy, cashew sauce which tops the pie. It makes a wonderful entree for a family or close friends’ dinner party, along with rice, salad, salsa and tortilla chips, and maybe vegetable fajitas and margaritas. 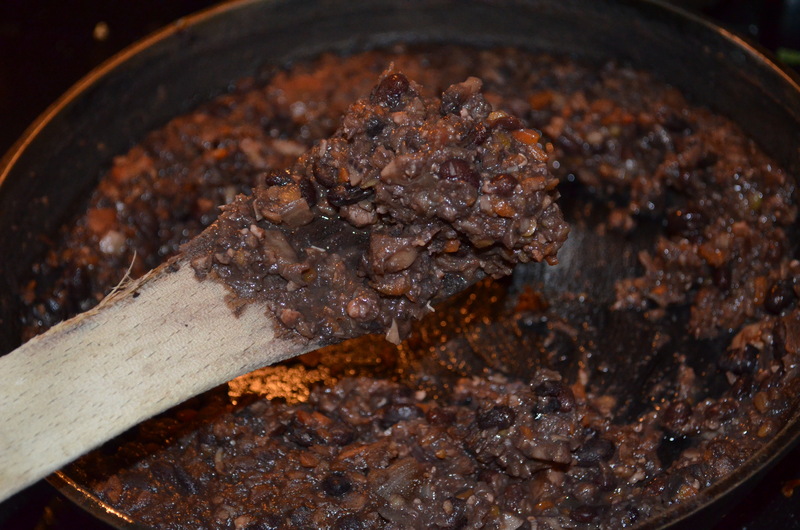 You can ring the changes by substituting refried beans for the black bean chili. Make the Black Bean Chili. Make the Ranchero Sauce, and blend until roughly smooth. Put cashews, miso, lemon juice, salt, chili pepper, nutmeg, and 16 fl oz (2 cups) of water into a blender, and blend until completely smooth. Transfer the cashew sauce to a saucepan, and heat until thick and bubbling, stirring frequently. Cover the bottom of a lasagna pan (~12″ x 8″) with 1/2 of the ranchero sauce. Take one of the corn tortillas and place about 1/4 cup of black bean chili in a stripe down the middle, then roll the tortilla around the filling and place (seam side down) in the lasagna pan. Repeat with the other tortillas. Spoon the remaining Ranchero Sauce over the enchiladas, followed by the cashew sauce. Cover lightly with parchment paper or tin foil, and bake at 200C (400F) for 50 minutes, or until heated through. Delicata squash has a dense, rich flesh, and a thin edible skin, and it needs only a little salt to bring out the flavor, which is excellent. In my opinion, it is at its best when meltingly soft. I first came across it at a wonderful little diner called Our Bar in Washougal, Washington, where they baked the stuff, and tossed cubes of it into breakfast scrambles and vegetable fried rice. Stuffed Delicata Squash with Roast Potatoes and (vegan) Creamed, Garlicky, Cruciferous Veggies. Stuffing the delicata turns them into a vegan, formal dinner center piece. Both my girls gave it the thumbs up … they are very partial to formal dinners with roast potatoes, orange and cranberry sauce, and cashew gravy. The moist, herby, mushroom stuffing can be made the day before and stored in the fridge until required: a useful trait when there’s a lot of cooking to do! It must be about as damp as you’re going to want to eat it, as it doesn’t dry out much in the oven (and you wouldn’t want it to: quinoa tends to get a bit crunchy and stuck between your teeth if it dries out. Not so good.) 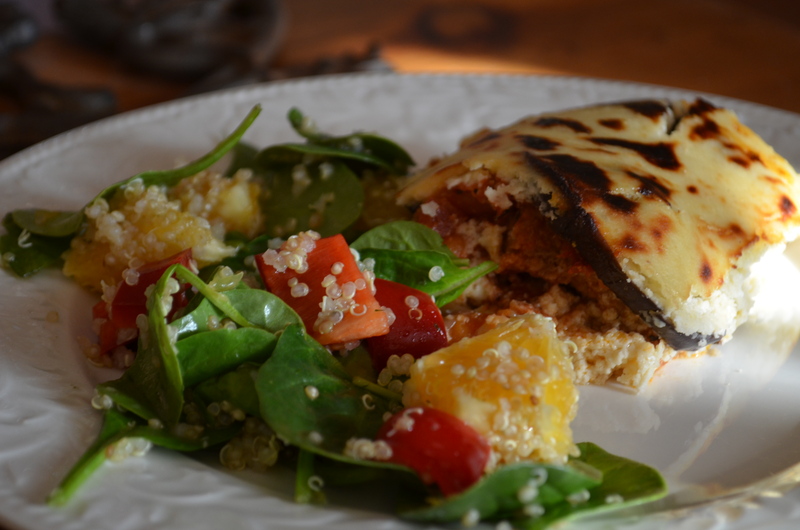 If you have any extra stuffing left over after filling the delicata shells, mould it into 3″ round patties, and cook them along side the squash, to eat later as burgers. Preheat the oven to 350-400F (depending on what else you have cooking in the oven). Wash the squash, then use a hefty knife to cut them in half from stem to blossom end. Use a spoon to firmly scrape out (and discard) the seeds, rub oil over all surfaces, sprinkle lightly with salt, and place (cut side down) on an oiled cookie/baking sheet. Cook the squash for about 30-40 minutes (or until a fork can pierce the flesh), then turn over, stuff with the mushroom mixture, cover lightly with baking parchment to avoid drying, and continue cooking until the nut mixture is hot (15-30 mins). Ah, comfort food. This is perfect breakfast food after a busy night. You can make it the day before, and feed 4 people with very little effort (and possibly a little toast) the next morning. It is warming and satisfying, but not at all heavy. I designed this with sliced red potatoes (grated ones cooked to a mush), and with the tofu on top so it can bake and dry slightly. Don’t miss out on the lemon / lime juice that’s added to both the onion/pepper mix and the tofu; it gives an interesting zing, lifting the flavor and reducing the amount of salt required. 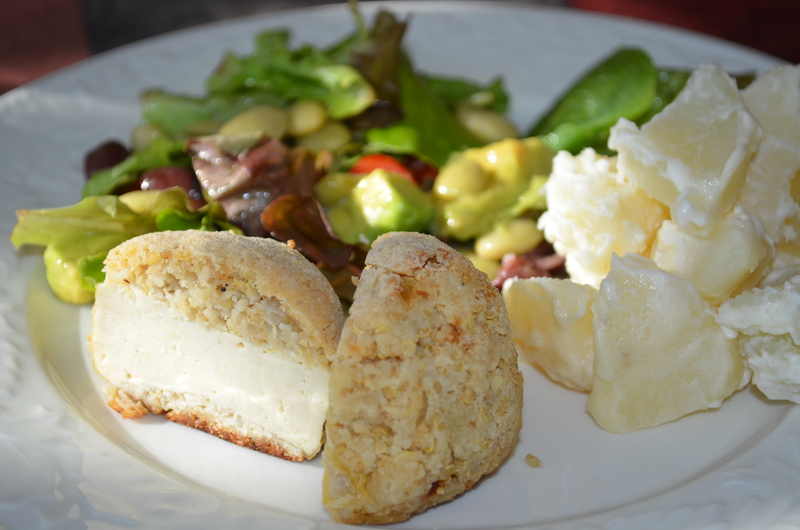 The general consensus of opinion was that the vegan cheese was a good addition, too, and needed to be all over the surface, albeit in a thin layer. 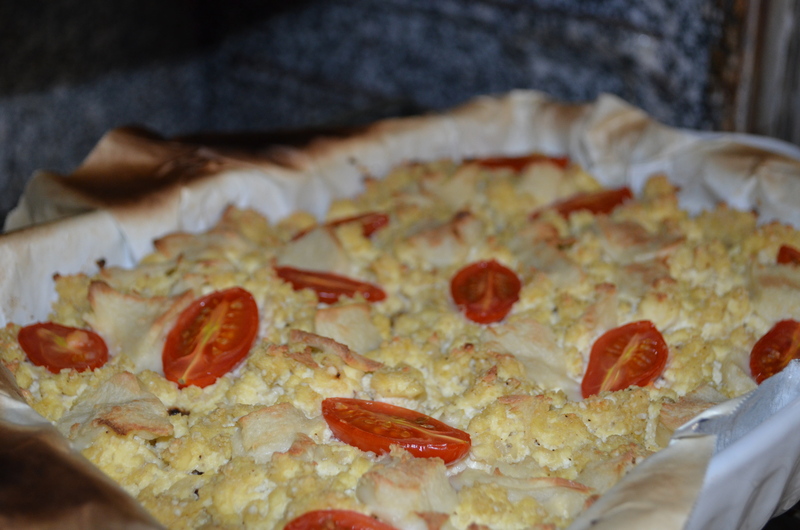 I baked it until both the cheese and the tofu were starting to brown. Optionally serve with Ranchero sauce and toast. Heat the oil in a large frying pan, and cook the onion and peppers over a medium heat, stirring occasionally, until softened, and the onions are starting to brown (~10 mins). Line a 10 x 8″ casserole dish with parchment paper or grease. Peel and finely slice the potatoes into the casserole dish, and toss with the 1/4 tsp salt, and 1/8 tsp ground black pepper. Distribute evenly over the bottom of the casserole. Sprinkle 1/4 lemon or lime juice and 1/8 tsp of salt over the onions and peppers, stir, then spread evenly over the potato. Combine the remaining ingredients (except garnish), together in a large mixing bowl, and mash thoroughly with a pastry wire (or the back of a sturdy fork) until no large lumps remain, or pulse in a food processor, but do not puree. Spread evenly over the onion and pepper layer. Press the tomato and cheese garnish into the top of the tofu layer. Bake in the middle of the oven, at 400F for 30-35 minutes. Check the potatoes are completely cooked by sticking a fork into the middle of the dish, if still not soft, cook for another 10 minutes. Serve warm rather than hot, optionally with Ranchero Sauce and almond bread. Vegan Haggis with Neeps and Tatties. Gluten free and vegan haggis. I would think all three of those are weird to the mainstream eater! Haggis looks very much like a sausage overstuffed with cooked minced meat, or soy chorizo, so finely chop up all the ingredients. I chop mine by pulsing them in the food processor. I previously used mushroom powder to help with the meaty / umami flavor, as well as the fresh mushrooms which give a chewy texture, but updated the recipe to miss the dried mushroom which gave it a slightly stodgy texture. Authentic haggis contains quite a quantity of oats, and although I know that GF oats should be O.K. for my tummy, I remember feeling not so well after eating them, and haven’t given them another chance since. You could add them if you really wanted to. The flavor of this is very satisfying. It is filling, and warming, lightly spiced, and savory. I did wonder whether I should throw a wee dram of whisky into the mixture, but I couldn’t quite bring myself to do that to single malt scotch. (Update: I tried some with a little whisky, and daughter #1 was not at all keen, so we’re leaving it out.) The texture of the filling is soft and hearty, and contrasts well with the chewy rice-paper covers. All served with gravy and mashed tatties or swedes: very homey and satisfying. Make 12 individual haggis, enough for 6 folks. Heat the oil in a saucepan over medium heat, and sauté the onion and carrot for 5 minutes. Mix in the mushrooms and garlic, and continue cooking 5 minutes, stirring occasionally. Stir in the lentils, water, salt, pepper, nutmeg and ground coriander, and simmer gently, uncovered, until the lentils are no longer crunchy. Add the remaining ingredients (except for the rice-paper wraps). 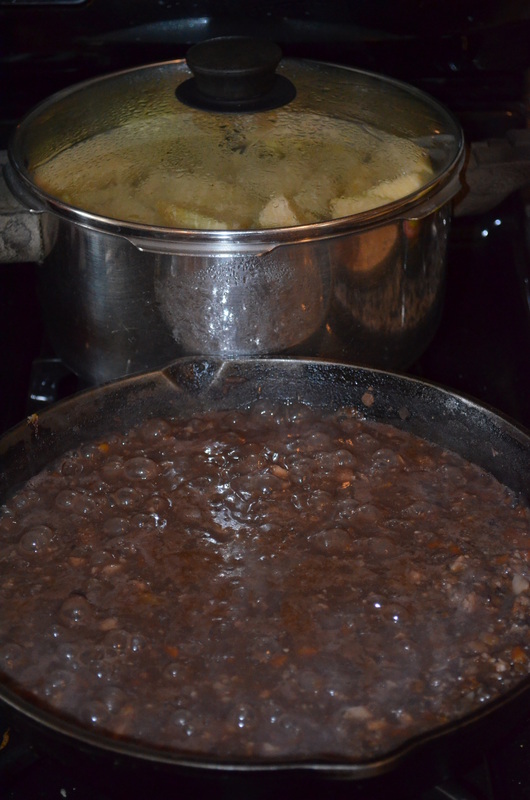 Stir, turn the heat down to low, and simmer gently until the haggis filling is a thick, spoon-able consistency. Check that the lentils have fully softened, and if not, add another 4 floz of water and continue simmering. 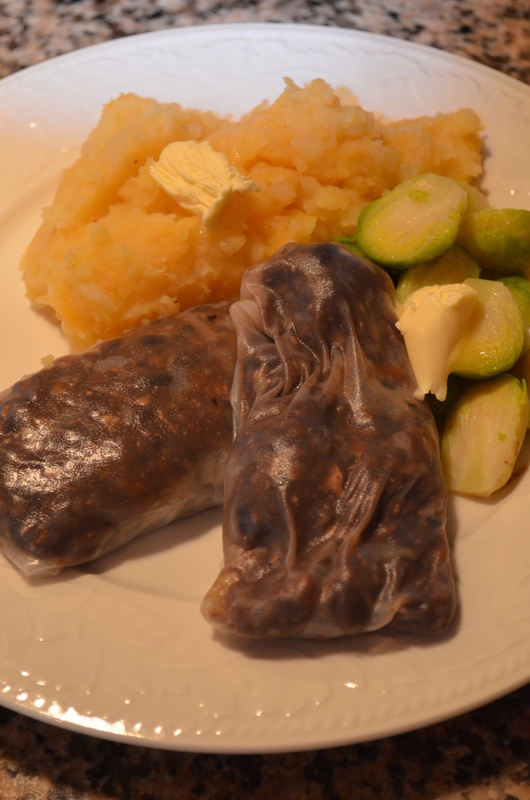 Turn off the heat, cover, and put to one side while you compose the haggis parcels. Set up a frying pan wide enough to hold the rice papers, with 1/2” of water, heated until finger hot. Place one rice paper in the hot water, holding it down with your fingers so it doesn’t curl up on itself. 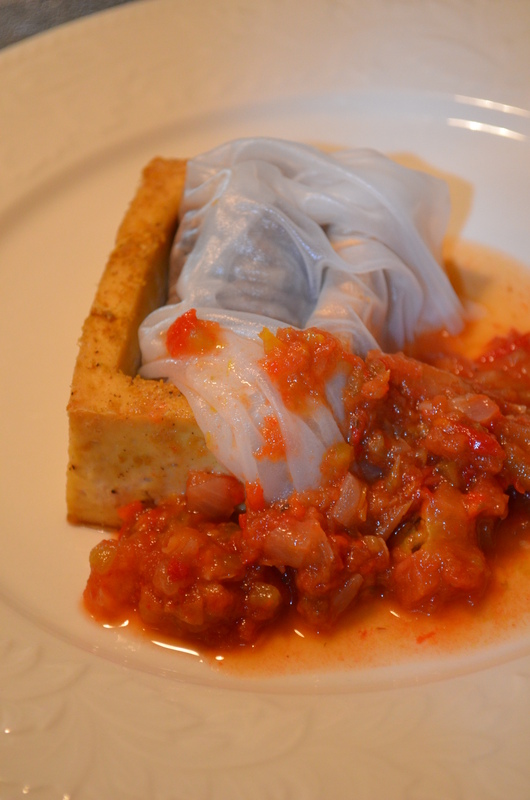 Allow the rice paper to soften for 20-30 seconds, until soft and pliant. Transfer the rice paper to a plate; place 1/4 cup haggis mixture in a 2” by 1” sausage in the center, then fold the rice paper first over the short sides of the sausage filling, then roll the haggis up to complete the casing. Put the haggis on a warmed plate to one side, covered with tin foil to keep warm, then repeat with the next rice paper, until all the mixture is used up. Serve hot, with mashed potatoes and swede (neeps). I don’t know whether the original version of this really came from Scotland, but this is my vegan/vegetarian version of the British classic, Scotch Eggs. Vegetarian version of the traditional Scotch Egg. I confess that I have more than one way I make these, and I have made more than one version at the same time to satisfy different dietary preferences. 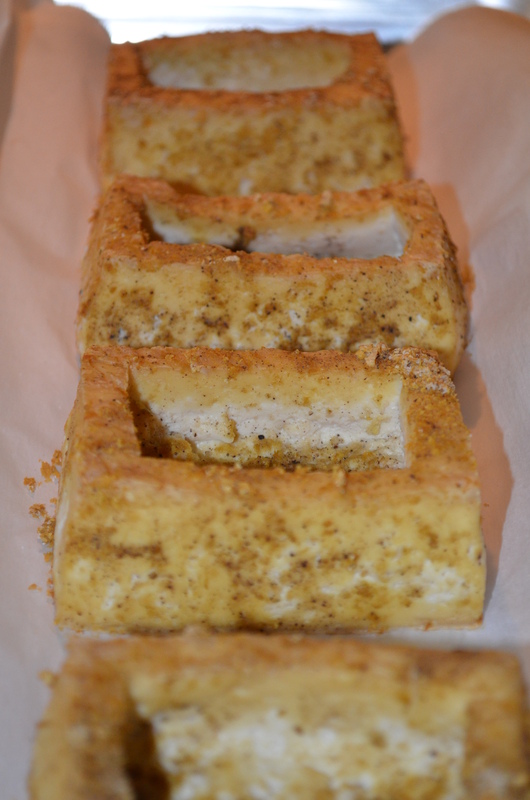 One version involves the more traditional boiled egg wrapped in a less traditional nut mixture. 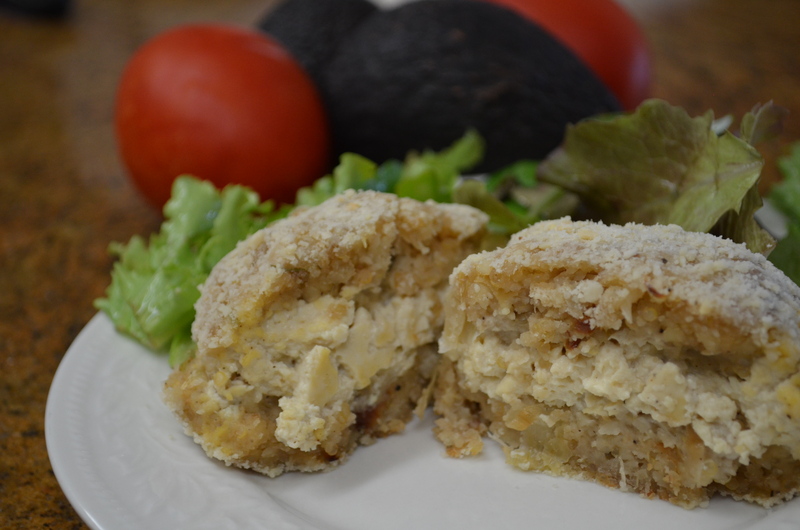 Another way uses chunks of boiled and cooled tofu (only for seasoned tofu eaters) wrapped in the same nut mixture. 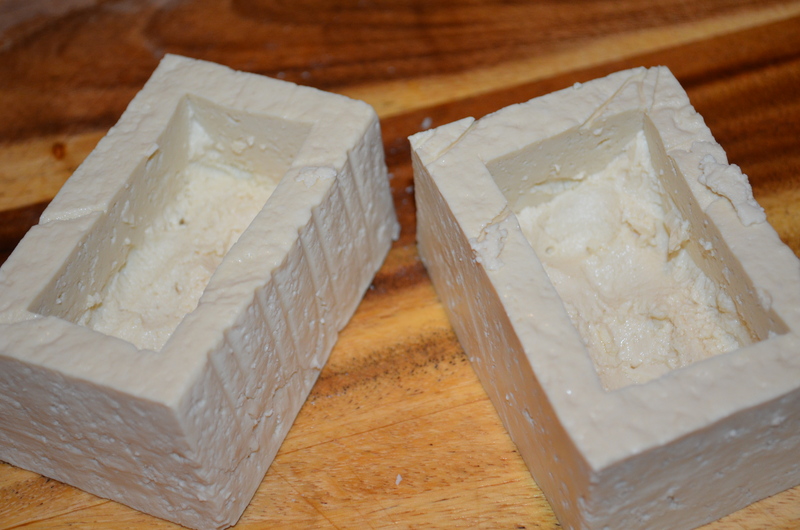 A third, more involved, way uses boiled and cooled, roughly mashed tofu. This last way is my favorite, though it makes an egg that is better eaten with knife and fork rather than fingers. Vegan version of scotch egg, using cubed tofu filling. Regardless of the filling you chose, note that you need to keep the nut mixture in a relatively thin layer (because a thick layer makes these too big for one serving), and the nuts fairly well ground (lumpy doesn’t work well; it lacks integrity), and the eggs/tofu cubes need to be dredged in GF flour before being wrapped in the nut mixture, otherwise the mixture won’t stick to the filling. Traditionally, Scotch eggs are deep fried, but I bake these in the oven, which helps keeps the fat content down, as I can’t stomach lots of fat. However, if you try deep frying these, I’d be interested to know how you get on. Filling option 1) Use the tine of a fork to pierce a small hole in both ends of the eggs (to let out any air), and place in a saucepan with enough water to cover. Bring the water up to a simmer, and cook the eggs for 10 minutes. Drain the eggs and immediately use cold water to bring their temperature down to a level where you can shell them. (This stops them from forming a green line around the outside of the yolk.) Once cold, dredge the eggs in a couple of tablespoons of extra GF flour so that the coating will stick. Filling option 2) Cut the tofu into 1″ cubes, and simmer in water seasoned with the salt and onion powder for 10 minutes. Drain, and place in the fridge to cool on a surface that will allow expressed water to drain. I use a steamer basket on a plate. Once cooled and firmed up, roll the tofu in a mixture of the salt, pepper, onion and garlic powders, and a couple of tablespoons of GF flour so the coating will stick. Only seasoned tofu lovers should try this one. Filling option 3) Follow instructions for Filling option 2), then mash the cooled tofu with a fork, and combine with the mayonnaise, onion and garlic powders, salt and pepper. Note that if you use this filling, you’ll only be able to make 4 eggs, as the mixture is less easily formed into Scotch eggs, and you’ll need to use twice the amount of nut mixture to encase each ‘egg’. This is also my favorite! Put the quinoa, salt, and rosemary in a saucepan with 2 cups of water. Cover, and simmer for ~20 minutes or until the quinoa is completely soft and the little ‘tails’ are visible on the grains. Heat the margarine or oil in a frying pan, and gently saute the onion over a medium heat until softened. Add the garlic, and allow to warm through for a minute or two. Grind the nuts in a food processor until fairly fine, if using whole nuts. Stir the ground nuts / flour into the onion, along with the Braggs (if you used unsalted nuts), apple puree/sauce, pepper, and lemon juice. Take 1/8 of the nut mixture in your hand and form into a flattened patty in one hand. 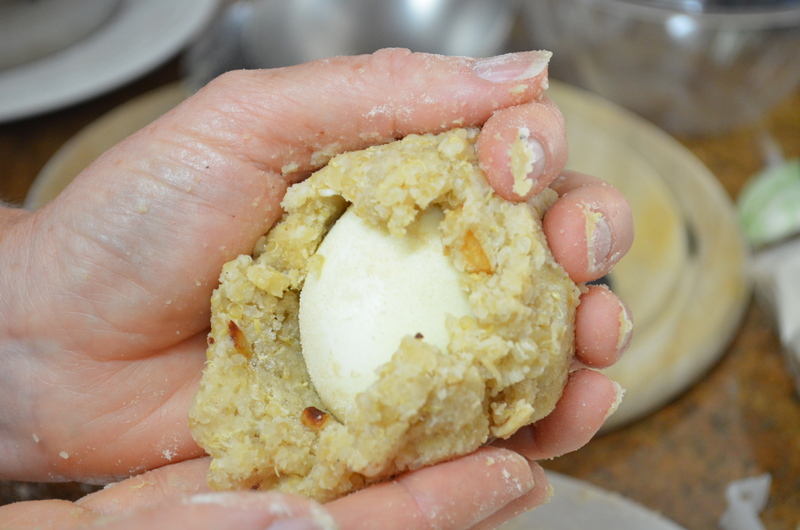 Place an egg sized ball of your filling into the center of the nut mixture, and work the nut mixture up and over the filling so you end up with a small ball of filling surrounded by nut mixture. Note that if you’re using the mashed tofu option, you’ll need to top with another patty of the nut mixture as it’s too difficult to work the nut mixture around this soft center. Heavily dredge the ball with the remaining nut flour, (this helps to keep the quinoa in the nut mixture from going hard while in the oven), and place on a baking sheet lined with baking parchment. Repeat the process another 7 (3) times with the remaining mixtures. Lightly cover the ‘eggs’ with parchment paper or foil to prevent drying. Bake in the middle of the oven at 350F for 30 minutes, uncovering after 15 minutes. My husband loves eggplant (aubergine), but I don’t cope well with all the oil that is often associated with cooking it. My kids will also eat it, but only if the skin doesn’t cause them trouble by being stringy, so my moussaka recipe addresses both of those issues. The moussaka dish I made here was a family version, but it’s easily converted to one that you’d present to friends, just by duplicating the layers, or adding a middle tomato sauce layer separated from the other layers with grilled aubergine to make a thicker dish. This moussaka (from the bottom up) is simply a layer of garlicky black olive and mushrooms; a layer of grilled (broiled) aubergine; and a layer of creamy white sauce. The strong flavor of the salty black olives and garlicky mushrooms contrasts well with the mild tasting white sauce; and the aubergine imparts body. I have also made moussaka with meetoo instead of the mushrooms, which went down well with my daughters. Choose young fruit. Older eggplants will have developed seeds (which are brown and have a tough coat) and might even have developed a cavity in the center which leaves your slices with holes in the middle! Cut the stem end off the eggplant. Take a fork, and score the skin from stem end to flower end. This makes it much easier to eat, but the skin still helps the eggplant to retain its integrity. 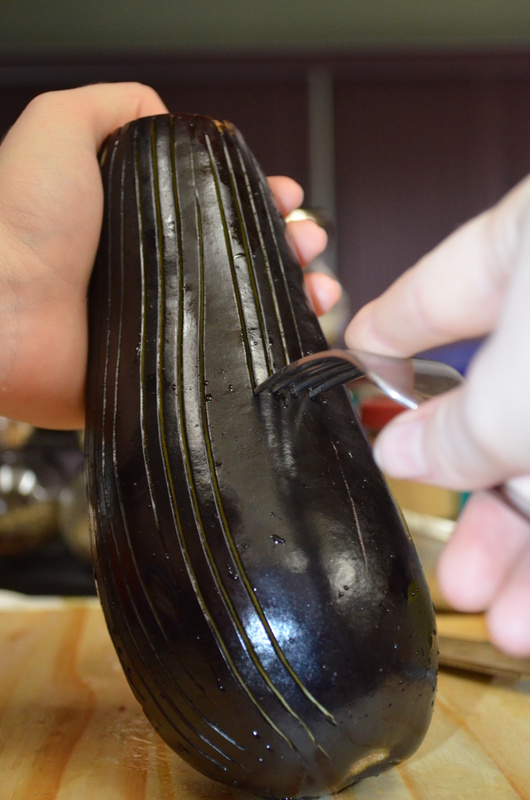 Now slice the eggplant into 1/4″ thick rounds. Make them as even as possible so that they cook evenly. If you have a problem with bitter eggplant (not so common these days), you can taste a small raw piece. If there is any bitterness, then you should consider salting the slices before continuing. This not only draws out any bitter juices, but reduces the amount of oil needed for cooking. That’s got to be a good thing, right? To salt the sliced eggplant, sprinkle about 1 tsp of salt evenly over all surfaces, and leave to drain in a large bowl for about 20-30 minutes, turning occasionally with a spoon. 2 or 3 tbsp of clear brown liquid will be released, and the eggplant will ‘relax’ and turn slightly brown. Rinse the eggplant under running water, and then carry on cooking as per the recipe. Make the white sauce and leave on one side to cool slightly. Lightly oil a baking (cookie) sheet with olive oil (~1 tbsp). Place the eggplant slices on the baking sheet, and quickly use a pastry brush to lightly oil (~1 tbsp) the tops of the eggplant slices. Note that all oil will be almost instantly absorbed, so don’t try to leave an oil film on the surface. 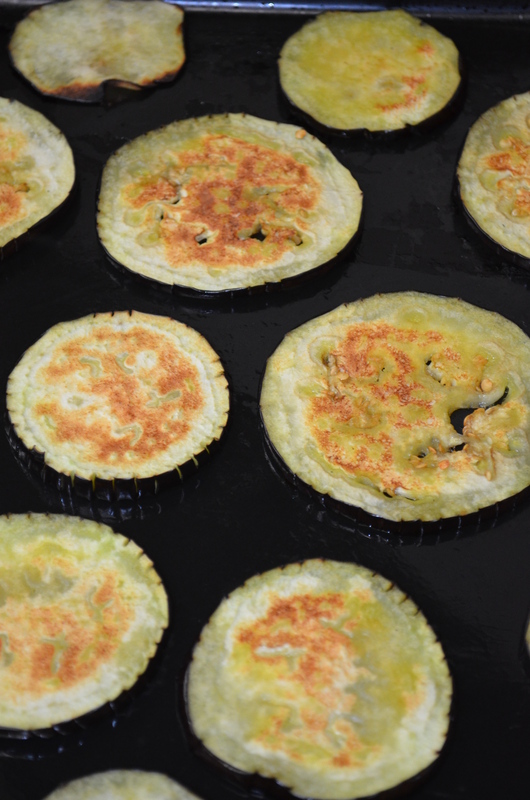 Place the aubergine slices 4 or 5 inches under a hot broiler (grill), and cook until lightly browned. Turn over the slices, and return to the grill (broiler) again until lightly browned and softened. Heat the margarine/ olive oil in a large frying pan, add the mushrooms, and sprinkle them with the salt. Saute until the mushrooms have softened and released their juices. Add the garlic and black olives to the mushrooms, and allow to warm through. Beat the egg, if using, into the cooled white sauce. In a medium sized lasagna dish (use individual serving dishes for vegan version, as the white sauce won’t set solid), make a layer of the mushrooms, cover with a layer of the grilled aubergine, followed by a layer of white sauce, smoothed over with the back of a spoon/spatula. Cook on the top shelf of the oven for about 30 to 40 minutes at 350F-400F (it can sit in the oven while the latter is warming up) until the egg has set the white sauce, and the bake is heated through.